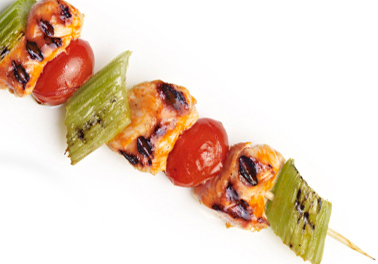 On each 8-10 inch skewer, alternately thread chicken and celery, leaving 1/4 inch space between each piece. In a small bowl, mix oil and pepper sauce; brush over the chicken and vegetables. Sprinkle with pepper blend and seasoned salt. Cover and grill kabobs over heat 15-20 minutes, turning occasionally, until chicken is no longer pink in the center. On 4 plates, arrange the romaine lettuce, top with kabobs and serve with dressing. This entry was posted in Chicken, Entrees, Metabolic Medical Center Recipes, Modified Profast (Fast and Flexible) Recipes, Nutriplus Recipes (Balance Your Pyramid), Party & Entertaining and tagged buffalo chicken, Chicken, fat-free blue cheese, grilled chicken, red pepper blend, romaine lettuce by foodies4mmc. Bookmark the permalink.